The U.S. and Indian governments continue to work on at least a couple of proposals to shift production of fighter aircraft from the United States to India. The core problem, as outlined by Aditya Kalra and Sanjeev Miglani, is that U.S. firms worry about the security of their technology. Lockheed Martin and Boeing, in particular, have expressed concern that by taking a minority stake in joint ventures with Indian companies, they will lose control of sensitive military technologies. Acquisition of technology (especially sensitive defense technology) is a key part of the deal for the Indian government, which has continued to struggle with developing a world-class defense industry. Protection of technology, conversely, is a key demand of U.S. firms considering partnerships in India. As Indian rules limit foreign partners to a 49 percent stake in any joint ventures, the U.S. firms have real concerns. With respect to the F-16, the technologies in question have matured to the extent that it is unclear how exposed Lockheed Martin is to the risk of technology appropriation. However, the terms of the F-16 deal will set a precedent for future collaboration between U.S. and Indian defense and technology companies. Boeing faces a similar situation with the F/A-18, although some of the technologies associated with the Hornet are more cutting edge. American firms have also expressed concern over the ability of private Indian firms to manage production of sophisticated aviation technology. Apart from HAL, few Indian companies have extensive experience with producing components for military aircraft. 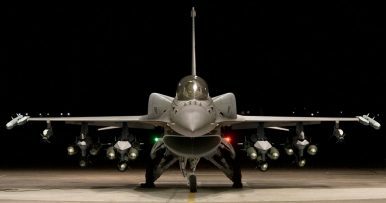 Given that Lockheed Martin, at least, expects to produce F-16s for export in India, the ability to manage the manufacturing tree is a serious concern. The debate (perhaps not yet a dispute) takes place against a dual backdrop; first, of hopes in both Washington and New Delhi for a closer strategic partnership, and second, of long-term concerns over the protection of American intellectual property in India. The Trump administration has pursued both of these issues with varying degrees of seriousness, while Modi has, perhaps implicitly, suggested that the latter is negotiable in pursuit of the former. One government official, at least, has suggested that U.S. firms can expand their stake beyond 49 percent, depending on the sophistication of the technologies they bring to the partnership. How this would function in practice remains unclear, however. Still, similar concerns over technology transfer scuttled the largest envisioned version of the Dassault Rafale deal; they have also repeatedly cropped up in the Su-57 joint project with Russia. Both of these situations were different in character from the U.S. complaints, however, as both involved Hindustan Aeronautics Limited as the lead Indian contractor. In the case of the Su-57, concerns were more about the Russian production side than the Indian, although with the Rafale the French repeatedly raised concerns about the quality of Indian production and maintenance. These concerns seem manageable on their face. However, Boeing and Lockheed Martin wield significant influence in Washington, and the Indian defense bureaucracy have proven intractable before. It is possible that the two sides will not find their way to a deal, especially given the availability of other fighters for the Indian Air Force.